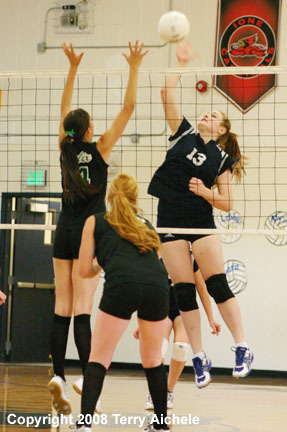 ECHO - The Echo Cougars hosted the Helix Grizzlies in a volleyball match on Tuesday afternoon. Helix defeated Echo overall but the Cougars did put up a fight. The first set was the only blowout of the match. Long runs of serve by Kylee Rogers, Britney Smith and Meghan Schroeder ran the Grizzlies score up to 15-7. 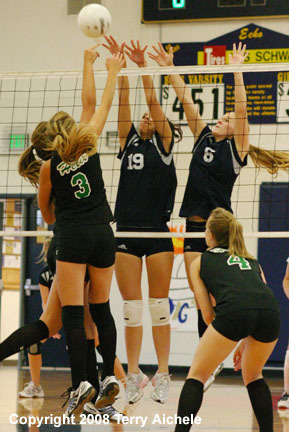 Echo started scoring but it was too little and too late with the final score of the opening set being 25-14. Echo turned the intensity up a notch for the second set and played tougher against the technique driven Grizzlies. The teams tied at 2-2, 3-3, 6-6, 7-7, 12-12, 15-15, 16-16, 18-18, and 22-22. Echo tried to break the timing of the Grizzlies by dumping the ball after only one bump or set. The ploy was partially successful but not enough for the set win. The third match started off with the Grizzlies taking a 8-2 lead. Echo battled back against an almost mechanical offense by Helix. One thing that hurt the Cougars in the third set was several missed serves that turned the ball over to Helix in a side out. Even with those issues Echo closed to 17-13 at one point but Helix overpowered the Cougars for a 25-20 win. 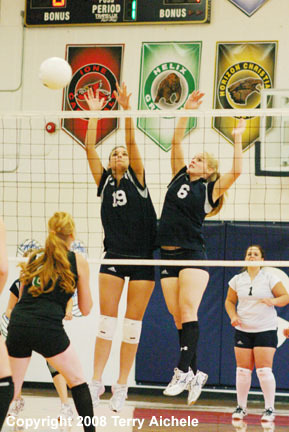 LEFT - Echo Cougars Lauren Elligsen, left, and Elizabeth Ferge team up to attempt a block at the net. 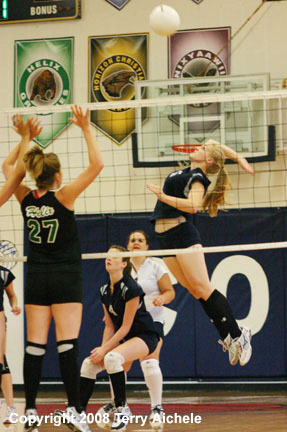 RIGHT - Elizabeth Ferge of Echo leaps high to hit a spike. 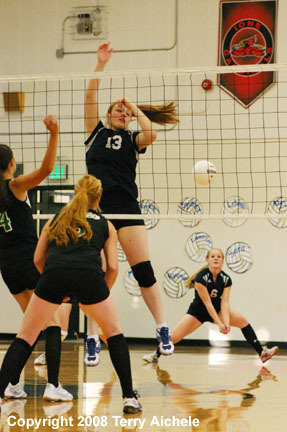 LEFT - Echo freshman Kirsten McCallum spiking at the net. 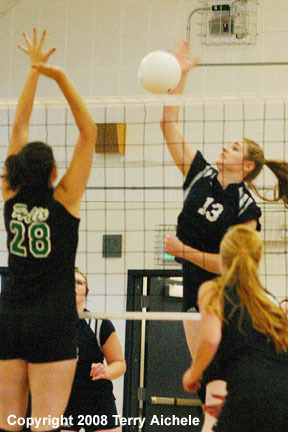 RIGHT - Elizabeth Ferge of Echo stretches to bump the serve. 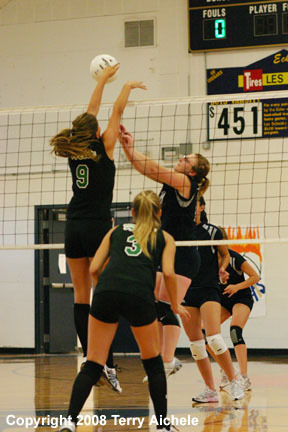 LEFT - Kirsten McCallum of Echo spikes the ball. 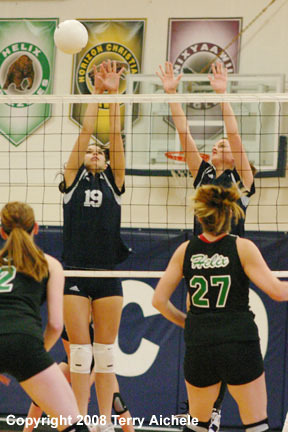 RIGHT - Lauren Elligsen, number 19 from Echo, attempts an offensive block along a crowded net. LEFT - Chyanne Hack of Helix spikes the ball against Lauren Elligsen of Echo. 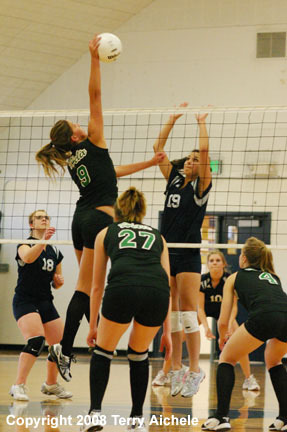 RIGHT - Mariah McQuown in far court wearing glasses tries to defend a shot by Chyanne Hack of the Grizzlies. 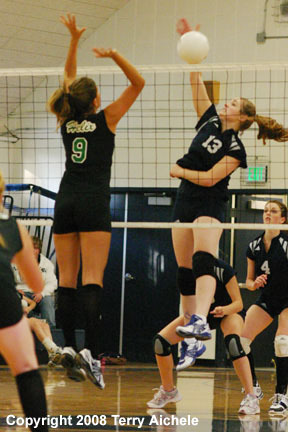 LEFT - Freshman Kirsten McCallum puts some spin on the ball as she spikes the ball against Chyanne Hack of Helix. 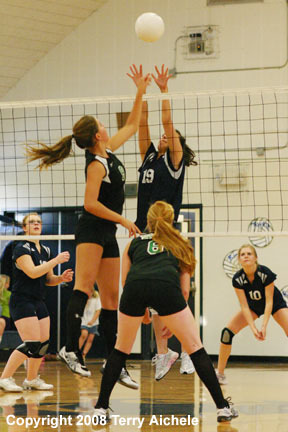 RIGHT - Lauren Elligsen sets up for an offensive block at the net. 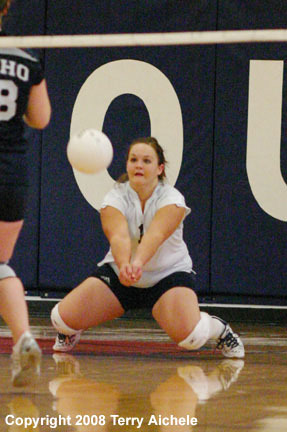 LEFT - Echo's libero Shilah Hilliard goes to her knees to bump the ball. RIGHT - A Grizzly shot is deflected by Lauren Elligsen of the Cougars.